As a new year is upon us, not only are we excited about the many new opportunities that will arise throughout the coming months, we are quite delighted to announce that we have a variety of new equipment headed our way. Contrans has 12 new trailers and 8 new trucks on order which will hit the roads very soon. We also have 15 more trucks scheduled to arrive throughout the year, currently divided between Internationals and Freightliners. 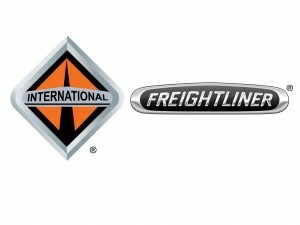 Both the International and Freightliner truck companies share an equally interesting and passionate history in the trucking industry. Feel free to check out their websites to learn more. Formed in 1902, International is a leading producer of medium trucks, heavy trucks, severe service vehicles. Our products, parts and services are sold through a network of nearly 1,000 dealer outlets in the United States, Canada, Brazil, and Mexico and more than 60 dealers in 90 countries throughout the world. Freightliner Trucks was founded on innovation and customer satisfaction. Leland James, founded the Corporation in 1942. Once the president of another trucking company, his idea of building truck components with lightweight aluminum instead of traditional steel met with initial resistance and skepticism. So James hired a team of engineers and built the first Freightliner truck.